Tiny Truths Illustrated Bible is a great addition to our children's Bible collection. Zonderkidz have done it again, producing and publishing a beautiful children’s Bible for your household to enjoy over and over again. Written by Joanna Rivard and Tim Penner, this Children’s Bible is definitely one to enjoy first thing in the morning, or last thing at night, or ANY time of day for that matter! We love it. 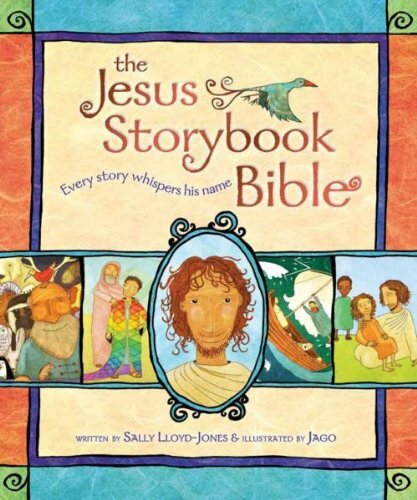 This Bible is very much a storytellers dream, bringing the truth of the Bible to life for little ones in a fresh accessible way. It’s not traditional in the sense of quoting verses, or giving references to where you can find the stories in a ‘grown up’s Bible’, but it so beautifully engages the reader as it comes alive off the page, that the story will no doubt be written on your heart by the time you are finished. We love the illustrations, the representation of the characters, and the golden thread that keeps each story flowing to the next: God’s great love for his children. I was particularly pleased with the simple Gospel of Jesus’ death on the cross. Often this can be overlooked or described in too much detail, often too gruesome for little ears to hear. However, Joanna Rivard and Tim Penner encapsulate the big depths of this story in just a few short sentences, without the blood and the scars and the horror, making it simple and age-appropriate for little hearts and minds to read. We all search for ourselves in the stories we read, and children especially do this, but when it comes to the Bible we also look for the evidence of what God thinks of us and his people. I am over-the-moon to not have another white-skinned Jesus book on the shelves, but rather a beautiful and whimsical Bible that is representing the black community. For little ones to see themselves as heroes of the faith, and helpers of the True Hero (Jesus!) is so important. My only disappointment and critique is that the diversity doesn’t stretch to include more of the wonderful stories of the powerful, inspirational and important women in the Bible. The emphasis is on the well-known male characters, with some female faces popping up here and there is rather disappointing, but something you may be able to overlook. It doesn’t detract from the message of God’s love, but it would have for sure added to it. The representation of women could’ve been more than Sarah, a reference to Rahab, and the Queen of Sheba, before we got to Mary. The inclusion of pictures of women in the illustrations, in the crowds, throughout the story does rescue this absence a little, but I want my daughter to grow up knowing that she is important to God, and for both my children to be convinced that women are just as important to God and His big story. However, this detail won’t stop me buying it for everyone I know! We will surely be stocking it at ChristCentral, in our Kids Church Sunday School. This is definitely one to add to the Birthday Gift list for kids aged 3-7 years. Who will you buy it for? Enter for yourselves, for your Church or for a friend!